IBM’s Smarter Commerce Global Summit Nashville just completed May 21-23. Hundreds of speakers shared their best practices and lessons learned. What were some of the key takeaways for digital marketers and analysts? Surprise lessons? The hot trends of the times? I asked a few of the digital marketing thought leaders that were in attendance. Here is what they observed. The biggest takeaway for me was how one of the large department store customers of IBM’s has expanded their use of data and integrated analytics across the physical and digital channels. It was great to see how stores can begin to leverage the insights that the online team has and vice versa to create better experiences cross-channel for their customers. My biggest takeaway was how IBM is making cross-channel marketing a reality with its marketing solutions. It also was interesting to learn about the cutting edge digital personalization campaigns possible using Tealeaf’s revolutionary behavioral analytics. Last but not least, the transformation of marketing attribution to statistically-significant outcomes leads us one step closer to real time budgeting by knowing which efforts truly deserve credit for downstream sales. The predominance of omni-channel as not just a buzzword but a concept that many are really beginning to embrace and tackle was something I saw again and again. Moving from the concept of multi-channel, where the emphasis was more focused on simply getting a brand’s presence extended to various new and emerging channels, toward omni-channel, where a true understanding of customer experiences across mobile devices, interaction channels, and social networks, can really begin to allow marketers to offer a consistent and personalized experience. The business goal is to get to marketing that feels like a service, i.e. is a “youtility” as keynote speaker Jay Baer put it. My #1 take away from the event is that IBM is very focused on building a product suite that truly is integrated and that can provide incredible power to the marketers looking to build customized and unique experiences for their customers. If you think further about how the capabilities from IBM Watson can expand the possibilities, you’re talking about a game-changing ability to make sense of data to identify key personas/segments for optimization efforts. Own the customer experience. We need to stop thinking about digital and physical as two separate things and capitalize on the magic that happens when we can combine them. We can use this knowledge to maximize the moments with customers, creating a personal experience for each customer and treat them as the unique individuals that they are. My top takeaways were that enterprise marketers are continuing to look for ease of use for their solutions, best-of-breed technologies (as opposed to becoming a single vendor or single platform house), are intrigued by the possibilities around open technologies (open source/open standards), and continue to see a convergence of mobile, social, cloud and analytics worlds impacting their space. The emphasis has shifted from channel-specific, or even context-specific, strategies to a broader view – the omni-channel view. Or, in other words, we are going “from digital marketing to customer intelligence.” I think the term “customer intelligence” really captures what we mean by both omni-channel and Smarter Commerce – connected customers engaging via channels they choose, and expecting a compelling experience. I couldn’t say it any better than the journalists at Forbes who described the biggest challenges facing marketers in a recent article. The article is based on the recent IBM State of Marketing 2013 survey of which a sneak preview was shared with customers in Nashville. What do all the brilliant digital marketers and analysts that I got a chance to learn about in Nashville have in common, for example Chris Hogan, Eric Hoover, Ewald Hoppen, Inna Drut, Lisa Langan, Jennifer Stinchcomb, Michael LaHue, Nancy Flint, Sameer Khan, Venkata Duvvuri? When they speak, you hear the love for data in their voices. You hear the passion of turning data into better customer experiences. It reminds me of how the owner of a small corner store truly wants to take care of his or her customers and make them better off while looking out for business at the same time. This article is cross posted from the Smarter Commerce blog. 15 authors, 15 articles. Free, yet with priceless insights. Learn from marketing thought leaders how to engage with customers and create value for stakeholders in a complex digital world. Covers digital channels, marketing techniques, accountability and technology. Truly a must-read resource for every CMO! And, of course, all my gratitude to our 15 authors, bloggers, consultants whose insights into digital marketing strategy make up this ebook. The following is cross-posted from the original at the IBM Unica blog. Since IBM’s acquisition of Coremetrics and Unica our web analytics teams have been merged together like a deck of cards to make the best use of the combined development and best practices expertise. Our combined team now takes care of both IBM’s on demand and on-premises offerings and customers for web analytics. And as previous competitors, it was much to my surprise that we had been very like minded in the decade leading up to this merger. Both Unica and Coremetrics had been working in parallel to make sure web analytics delivered not just reports for optimization but also provided individual customer insights for refining relevancy of marketing messages. The next great coming together I see for our customers in the IBM Coremetrics Digital Marketing Optimization Suite is the tight integration between LIVE Profiles, Web Analytics, and the IBM Coremetrics Digital Marketing Applications such as IBM Coremetrics LIVEmail and IBM Coremetrics Intelligent Offer. This tight integration is the secret sauce that enables our users to execute more relevant digital marketing campaigns driven by analytics. The IBM Coremetrics suite inherits this product design from the Coremetrics side where this combo had been available for years while other vendors were merely talking about it in Powerpoint presentations. Now, like D’Artagnan teaming up with the three musketeers, the new IBM Coremetrics Suite adds increased flexibility and openness to the trio of LIVE Profiles, analytics, and digital marketing applications. This is being achieved thanks to experience and technology assets coming from Unica NetInsight OnDemand. And it is a true 1+1 = 3 situation. Not only can marketers extend their analytical lens by combining online and offline insights (using the new IBM Coremetrics Multichannel Analytics add-on), but now they can also target digital marketing execution programs, e.g. through IBM Coremetrics LIVEmail, using the cross-channel picture of an individual’s interests. All marketers have web metrics available to them. Competing on analytics requires us to be cleverer with our use of analytics than the next marketer. Technology needs to be our “power arm” that helps get things done quickly that would be very tedious, expensive, and time consuming otherwise. The new IBM Coremetrics Digital Marketing Optimization Suite provides IBM customers with a “power arm” that helps them go beyond commodity web metrics and move towards digital analytics where discovering new opportunities with segments or individual prospects and customers means more strategic opportunities. Our customers also have another growth path to go from analytics to digital marketing execution, and from there to integrations with their enterprise (e.g. to their Netezza data warehouse or their IBM Unica Enterprise Marketing Management system), and with the rest of their digital marketing eco-system, e.g. through the eco-systems of IBM Coremetrics LIVEmail (i.e. Email service providers), and IBM Coremetrics AdTarget (i.e. display ad networks). Now the ball is in your court. How are you going to put all these multichannel analytics and digital marketing opportunities into the race for beating out your competition? Existing NetInsight OnDemand and Coremetrics customers, please keep your eyes peeled for further information by email. Please register for the upcoming customer-only launch webinars. There is no requirement to move to the combined solution immediately. IBM plans on continuing support of the existing Unica NetInsight OnDemand and Coremetrics versions into the future, accompanied by the same industry leading service and support you have come to expect. IBM believes there are compelling components in the combined release that are meaningful and important to your business. In the launch webinars, you will learn about all the great business benefits that our Unica NetInsight OnDemand customers that upgrade will have available. For example, all customers can use their current and new release in parallel during their upgrade process. Our mini series at Digital Marketing One on marketing performance measurement and accountability continues with a contribution by Tom Manning on management techniques. I think what we have here is another reminder that returns in the short term aren’t always financial but can be strategic. Eventually, though the financial returns have to start shaping up (assuming a for-profit business) so that the initiative can be called successful. Tom is a partner with Ninah Consulting, who specialize in quantifying and helping increase marketing effectiveness and profitable business growth. They do this with analytical rigor and by producing models that lead to actionable recommendations. Tom Manning, guiding digital marketing spend. Should you Measure Brand Awareness? Comments Off on Should you Measure Brand Awareness? Something rarely seen appears in Jim’s article on five key principles for improving marketing ROI within the Digital Marketing One series for CMOs. 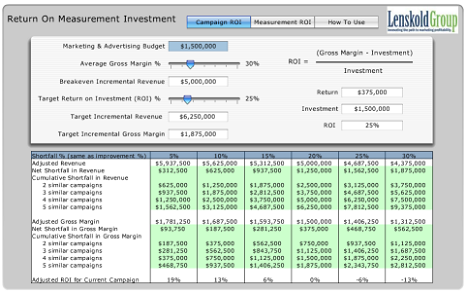 Namely, an ROI calculator for ROI measurement. Click the image and see the “Measurement ROI” tab on this calculator by the Lenskold Group. I have been loving how the authors in our Digital Marketing One series have packed pearls of wisdom from long years of front lines experience into tight paragraphs. Almost taking for granted the hard work that has to happen in order to follow the best practice recommendation. In other words a metrics based approach to metrics! Advice like this tends to be written out in long, long blog posts or entire books when us web analytics people try to write about it. Notice the little word “incremental”. Don’t care whether you use first touch or last touch or hold out groups. But the key to useful measurement is to get to that incremental contribution. Otherwise we are just wasting time on numbers games. So Jim article’s hsa advice on five best practices. Jim is the author of Marketing ROI and an international speaker on the topic. At his firm, Lenskold Group, his team produces and publishes many articles and research on the topics of marketing ROI, marketing strategies and business growth strategies. See Lenksold.com for additional free ROI measurement resources. Marketing budgets have a chance to grow in 2011, writes Laura Patterson in her article in our Digital Marketing One series for the CMO. I.e. marketers’ ability to prove the returns on the moneys spent. So, what is meant by accountability? Laura’s article is a great to read executive summary on that and includes 5 recommendations for getting it right. Something that I liked especially well in her article is that Laura doesn’t equate accountability with just short term financial ROI. Instead, read how she emphasizes accountability “to the financial and strategic initiatives of the organization”. Very well taken even if the strategic initiatives must of course in the long term also lead to financial ROI, unless we are talking about a socially oriented organization. Laura’s article kicks of a mini series on articles about accountability in digital marketing. Her company, VisionEdge Marketing, specializes in enabling organizations to leverage data and analytics towards accountability and operations, and better marketing performance. You may have seen Laura speak at various conferences. She is also the author of three books including Metrics in Action: Creating a Performance Driven Marketing Organization (Racom, 29). See also VisionEdgeMarketing.com for free resources. Here is a revised framework for digital marketing strategy. This fixes a number of shortcomings in the first version that I had proposed 10 days ago. For example, David Raab and Laura Patterson, members of the Founders Council of DigitalMarketingOne, caught a critical flaw in the earlier version. Namely, my placement of channels (e.g. Search, display, etc.) in the framework diagram was flawed. I placed them in specific locations of the customer lifecycle whereas they can play a role in many stages of the lifecycle. Additionally, I was in round table discussions at the eConsultancy peer summit in NYC, and it was a good reminder that many companies still haven’t made explicit what mission their digital channel has, i.e. how it should be contributing to the business. First of all, before CMOs think about using this framework they still ought to start with a higher level framework such as Doug Goldstein’s briliant work at MindOfMarketing.net. That global strategy needs to be in place so that the CMO can now drill-down to define the contribution of digital within the bigger setting. Job one is to define how digital is to contribute to the business and to the customer life cycle across multiple channels. Based on your digital mission your CMO can now derive the overall approach in terms of presences that you should prioritize (e.g. mobile, Facebook, website, etc.) and their related “site types” or business models, i.e. Based on these decisions you can then derive the top five KPIs and targets that you should work towards. You can also form an initial opinion on the ad channels that suggest themselves for the audience that you wish to reach. As pointed out in the last post, interactivity is what digital is really good at. So the new framework retains the prominent role for interactive marketing across the customer lifecycle. I removed the reference to channels (e.g. search, etc.) however since each channel can play a role in multiple lifecycle stages. The other strengths of digital are measurability and testing. This needs to be put to use towards continuous improvement. Using the insights marketers change their investments in the familiar cycle of continuous optimization. Unlike the original web analytics cycle of continuous improvement however, the emphasis here is that the continuous improvement applies not just to web pages and advertising. But you want to apply it to your entire digital and interaction strategy. Finally, your use of digital marketing technology should of course be determined by the digital and interactive marketing strategies that you are going after.